After a summer of grilled hot dogs and smokies, it might seem like sausages would be taking a breather until next year. But for aficionados, the season is just beginning. This year in Munich, Oktoberfest runs from September 17 through October 3, and around the world revellers will stage their own bratwurst and beer celebrations. Perhaps the German festival is so popular because plump cylinders of minced meat are beloved across cultures. While the stuffing and seasonings may change, sausages are associated with good times and happy memories. “My childhood [diet] was almost uniformly sausages,” recalls John van der Lieck, who co-owns Oyama Sausage Co. in Vancouver with his wife, Christine. A fifth-generation charcuterie maker, van der Lieck grew up in the northern part of Germany, a country that boasts over 1,200 varieties of sausage. When his father travelled, he would bring back delicious research to taste-test over dinner. For van der Lieck, autumn marks the start of sausage season. “In Europe, sausages were traditionally a cool weather dish,” he explains. That’s because animals were reared on natural feed through the spring and summer. Before the advent of refrigeration, fall was the best time to process meat. Rich sausages were also suited to winter appetites and became part of regional cuisine such as French cassoulet, Alsatian choucroute garnie, and British toad-in-the-hole or bangers and mash. Van der Lieck explains that pork is a popular sausage base because it’s mild and unlike beef, it easily adopts a variety of flavours. Bratwurst can be made from pork, veal, or beef, but this iconic sausage isn’t defined by its meat. Braten means to fry and wurst means sausage, so “Bratwurst is just a sausage that’s meant to be fried,” he says. There are hundreds of ways to make it, and the most important thing is that the meat is as fresh and high-quality as possible. Van der Lieck’s grandfather’s version is made from lean pork shoulder, pork belly, and veal shoulder with only white pepper and salt added. Besides this, Oyama offers a finger-sized Munich bratwurst called schweinswürstl, which is made from pork seasoned with lemon, caraway, and marjoram; as well as a Nuremberg pork bratwurst with allspice, mace, and marjoram. While the stuffing and seasonings may change, sausages are associated with good times and happy memories. The fine-textured, light-coloured pork weisswurst is also a version of bratwurst. Although it is pan-fried elsewhere, in its native Bavaria it is served only steamed or boiled, traditionally before noon. Van der Lieck notes that sausage making is highly regional and often holds deep cultural meaning. The French version of aweisswurst, for example, is boudin blanc. The white sausage (a mixture of meat—pork, pork and veal, or chicken—eggs, starch, spices, and milk) has evolved into a symbol of Mary’s virginity and has been linked to Catholic holidays. The taste for fine sausages crosses national boundaries. In Sausage: A Country-by-Country Photographic Guide with Recipes, Nichola Fletcher delves into their diversity. “People are so attached to the sausages of their homeland that it is inevitable that when they travel, they take their recipes with them,” she writes. “The nations that colonized other countries in the past left a legacy of sausages that were adapted to local conditions, ingredients, and customs.” Hence we find versions of Spain’s paprika-and-garlic-laced pork chorizo in countries like Mexico (including chorizo verde made with chilies,spinach, cilantro, and oregano) and the Dutch-influenced boerewors beef sausage with nutmeg and coriander in South Africa. Sausages reflect local tastes and economy. Chinese lap cheong sausages can be made of pork, pork liver, or duck liver; sweet and intense, they are often sliced to flavour dishes such as clay pot rice. In northern Thailand, glutinous rice is added to pork sai oua sausages that are fragrant with galangal and lemongrass. Australia’s “kanga bangers” capitalize on that nation’s kangaroo overpopulation, while many cultures make thrifty use of animal blood. Scotland’s Stornoway black pudding, for example, is made with oatmeal, beef suet, and pig’s blood. Preservation methods also differ, including various states of cooking and cold or hot smoking. According to Fletcher, most British versions, such as Cumberland sausage, are sold raw to be cooked before eating, while others like Italian salame cotto are cooked and ready to slice. Still other sausages, such as salame crudo, are dried and eaten raw. Then there are the casings. Natural ones come from the intestines of sheep, pigs, or cows, yielding sausages of correspondingly larger sizes. Artificial casings facilitate broader sausages, such as Italian mortadella. 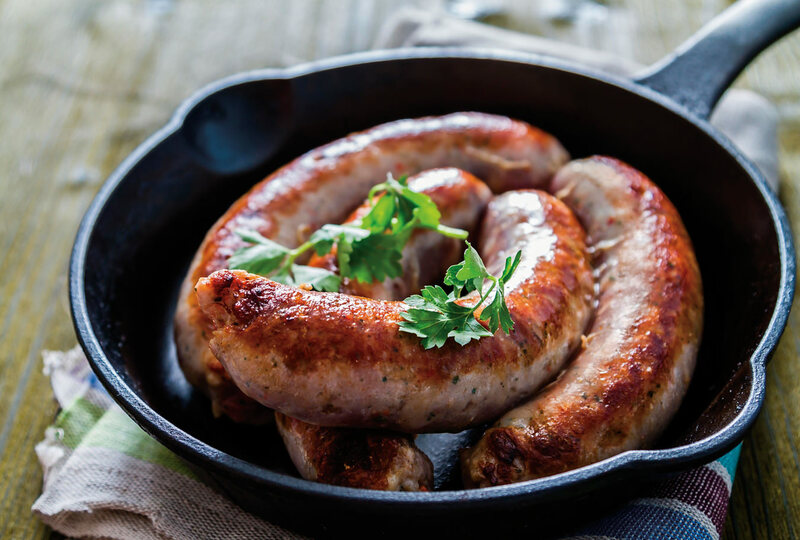 When it comes to cooking raw sausage, Oyama’s van der Lieck cautions against putting cold links on a hot grill or frying pan, since the resulting steam will make the casings explode. “That’s why they’re called bangers,” he explains. Instead, add a little butter and fry them uncovered on medium heat until they’re browned. Alternatively, poach them slowly in liquid such as beer or stock. Don’t pierce them during cooking; you’ll lose precious juices. As millions of Oktoberfest revellers can attest, beer is the perfect foil for greasy sausages. Craft cider is a good alternative, since apples and pork are a classic match. Toronto’s Wvrst beer and cider hall offers both options, along with a minimum of 25 varieties of sausage at any given time. The made-in-house selections include Canadian game such as elk, wild boar, venison, and rabbit, and vegetarian sausages contain such ingredients as tofu, chickpeas, corn, and cilantro.